Bathroom Decor - Hand painted metal bathroom wall hooks and toilet paper holders - Haitian metal art, Metal Wall Art, Recycled Steel Drum Art > Metal Wall Hook - Painted Metal Tree Frog Bathroom Towel Hook - 12" x 7 1/2"
Metal Wall Hook - Painted Metal Tree Frog Bathroom Towel Hook - 12" x 7 1/2"
Hand painted metal tropical frog wall hook. A colorful addition to your bathroom decor. Couple together with our matching bathroom toilet paper holder for a coordinated bathroom design. The painted metal wall hook can also be used in other rooms of the house or out by the pool to hold towels or swimming gear from it's nice, strong hooks. Hand cut from a flattened, recycled 55 gallon steel oil drum at our workshop in Port au Prince, Haiti. It is then carefully hand painted. 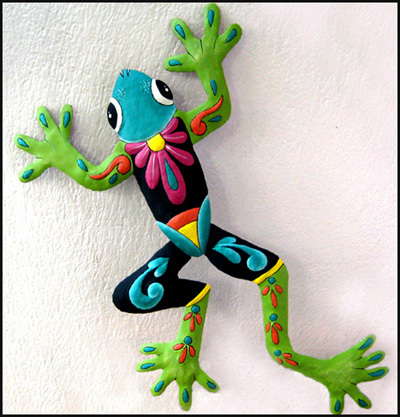 Decorative frog wall hook measures 12" high x 7 1/2" wide.